Parting is “Such Sweet Sorrow” and in the penultimate episode of season two we see everyone say goodbye to… everyone! 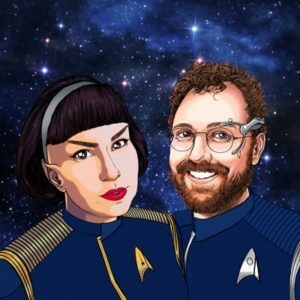 Pike and Culber are joining the Enterprise, Georgiou is now Captain of Section 31 (and getting her own show), Stamets is leaving Starfleet and what’s left of the bridge crew are going 1,000 years into the future. WHAT! It’s getting so so real. Do you think they’ll actually go? We’d love to hear your theories! The time loop episode that keeps ending in death is Coda, from Star Trek: Voyager’s third season. The Tenth Doctor and Rose are separated against their will at the end of Doomsday, the finale of the second series of modern Doctor Who, broadcast in 2006. After we stopped recording, Ben had the idea that perhaps the thing that Tyler needed to do was to find Harry Mudd and get a time travel suit like the one in Magic to Make the Sanest Man Go Mad. Carla considered that Mudd might well be on Section 31’s payroll – or at least a contact in their little black book. We just wanted that on record in case we are geniuses. I’m glad you liked my theory, it is so much fun to listen to your discussion, and share ideas with you. Obviously my theory has been overtaken by events, but I love your idea that Airiam is part of Zora. We saw her digital files deleted before her funeral, but the Sphere data has had full access to Discoveries systems for a while, and doesn’t like stuff being deleted. I also like your note above that Mudd might even be involved in the finale, and it has hint of possibility to me, especially after they referenced Runaway this episode. This season has had me so excited for each next episode, and I am excited about the next season. The idea of a complete removal from established canon could let the show do so much more. But I do want Stamets and Culber in it. We know that Spock has to end up on Enterprise, so fingers crossed that he and Culber swap during the fight for some reason. One last thing, we know that somewhere along the line, Discovery takes the long way round through time, and of course that could be far in the future, but if it happens because of some problem in the finale, how about Zora introducing herself as the cliffhanger to the next season? I hope you continue with the podcast beyond season 2, maybe doing more episodes for the Section 31 and Picard series’. Big fan, thank you.